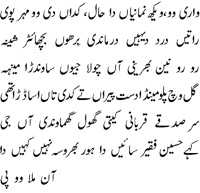 Shah Hussain stands tall among the all time greats of the Punjabi poetry. Although not a definitive list, they were Baba Farid, Guru Nanak Damodhar, Shah Hussain, Hafiz Barkhudar, Sultan Baahu, Bulhe Shah, Waris Shah, Sachal Sarmast, Main Mohammad Baksh, Khawaja Farid, Najm Hosain Syed, Bhai Gur Da, Qadir Yar and Najabat. The names of Guru Amar Das, Guru Ram Das and Guru Arjan's could conveniently be added but each addition necessitates another inclusion. The irony is that most of us are not familiar with the work of these masters. 'Maaye Nee' is the largest collection of the bard's poetry published to date. Shafqat Tanvir Mirza, the editor, and the late Ghulam Yaqub Anwar, the translator are among the pioneering propagators of Punjabi language. Shah Hussain, despite his undisputed greatness as a Punjabi poet, was practically unknown for about three centuries probably on accusations of apostasy. Unless we investigate and understand this censor, we cannot comprehend the essence or meanings of Shah Hussain's poetry. The hagiographic accounts of his life are historically flawed, like all hagiography. Shafqat Tanvir Mirza has been associated with every major publication of Shah Hussain's work. This is a volume of 193 'kafis' (songs) with all the known kafis. The original was a volume of 138 kafis, discovered by late Dr Mohan Singh Diwana, a Persian scholar and teacher at Oriental College. It was a printed volume found at a library in Sindh. Although published at Lahore in the beginning of 20th century no other copy of this 'find' exists. This 'lost and found' phenomenon illustrates the fate of most classic Punjabi poetry except what is preserved in the 'Granth Sahib' the Sikh Holy Book or Mian Mohammad Baksh and Khawaja Farid's work, the two who lived and died in the age of the printing press. There was no dearth of hand written manuscripts in Punjabi, a few thousand are still gathering dust at Punjab University Library, Punjab Public Library and a handful of private libraries in Punjab and Sindh. Shafqat Tanvir Mirza deserves credit for bringing together all the available kafis. The ones found by Dr. Mohan Singh (138) are the least tampered with. To these Dr Mohan Singh added twenty six found in the Punjab University Library and an 'ashlok' from 'Gur Blas' and 'Gun Shahd Ratnagar.' Twenty seven were added by late Dr. Nazir Ahmad in the 'Packages Edition' that were collected from various sources in East Punjab and India Office Library in London. Shafqat Tanvir Mirza was also associated with the Urdu translation in verse by Abdul Majid Bhatti published by "Lok Virsa". He must have persuaded Ghulam Yaqub Anwar for the English translation. Anwar was a second generation poet of Punjabi language. His book on Punjabi prosody "Bol Te Tol", is an authoritative work on Punjabi metres and rhymes "Marooz". The collection also carries an English essay on Shah Hussain's life and poetry by Lajwanti Rama Krishna. Titled 'Madho Lal Hussain' the essay is based on the hagiographic sources. The author laments the unreliability of the sources of certain events for example, "on hearing of Madhodal's death, Shah Hussain went to Madho's house and asked him, the dead Madho, to rise. Madho rose from the dead and thereafter converted to Islam!" Another significant note in her essay is about a quote from 'Tazkira Awliya-i-Hind' "which puts the number of Shah Hussain's followers at ninety thousand but says that other sources put the number at a million." The latter figure seems correct. The 'Hussaini Silsila' was phenomenal at Lahore and Kasur, the two large urban centres in the 17thcentury. I have orally heard Shah Hussain's kafis from old ladies in Gujranwala. One, an 85 years old and illiterate, and the other, a 70 year old, literate but unaware of Shah Hussain's printed work: therein lies the secret of Shah Hussain's disappearance. The ordinary people knew and sang Shah Husain, while academics remained unaware of him. He was not a religious party leader as most hagiographic accounts would like to paint him. All historical accounts agree on his having shaved clean his beard and having sung and danced in the streets of Lahore drunk with the rejects of the society; the poor, the dispossessed and the "branded sinners." Blessed are the streets of the great city of Lahore. Accursed are those who have been re-inventing Islam and history to serve different rulers. Shah Hussain was obviously 'harmed' because of his rebellion against the conventional religion. Shah Hussain is mentioned in the 'Haqiqat al Fuqra' written during Emperor Shah Jehan's time. The book in Persian was printed and translated, courtesy Shafqat Tanvir Mirza and Majlis Shah Hussain of which both the compiler and translator were active members includes a Kafi in the Persian text. There were two major editions of Shah Hussain's poetry, the reprinting of Dr.Mohan Singh's collection by Majlis Shah Hussain, Punjabi Academy and Pakistan Punjabi Adabi Board (several reprints). The Adabi Board edition was edited by late Prof. Asaf Khan and included a definitive essay by him 'What is Kafi?'. These Kafis were partially corrected during Asaf Khan's terminal illness. Those corrections were not included because the translations in this book were done of the original versions published by Majlis Shah Hussain in the nineteen sixties. 'Packages Edition' of Shah Hussain's Kafis was edited by Dr. Nazir Ahmad and printed in deluxe edition by 'Packages Ltd.' This made an invaluable edition (27 kafis) to the existing known kafis. Unfortunately not all the existing sources have been tapped. Dr. Lajwanti's essay has some kafis that are not included in either of the two major editions. The third significant edition was printed by Maqsud Saqib for Suchet Publishers. It made lot of corrections to the existing kafis but Saqib did not include 'Packages Edition' kafis because of the copyright constraint. The book under review has the largest number of kafis of Shah Hussain, printed anywhere. whenever you feel some mercy. And torture during the night.